I’m not a big fan of the dumplings in chicken and dumplings, there’s something about filling-less dumplings that doesn’t sit quite right with me. Then again, it could just be that I haven’t had proper chicken and dumplings. When I have had them, the dumplings are dough-y, thick and strangely flavourless. Generally, they taste like un-cooked balls of dough. I was hoping that Keller’s recipe for Chicken Soup with Dumplings would change all my biases against filling-less dumplings. All of the Ad Hoc recipes I’ve tried so far have been winners, so it was a good bet that this recipe would be a winner as well. 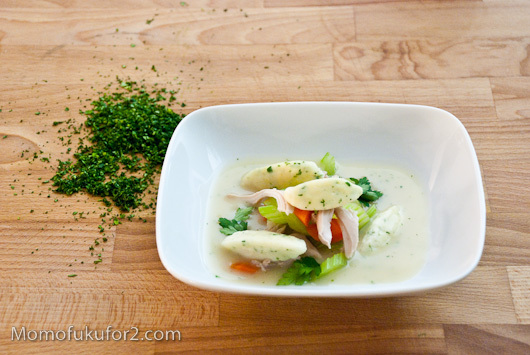 The photo of the soup in the book is gorgeous: succulent chicken, creamy soup and dumplings that look like they’re made out of mashed potatoes. The idea of mashed potato dumplings got me really excited, but that excitement died down quickly after I learned there weren’t any potatoes in the dumplings. From what I can gather, the dumplings in Keller’s recipe aren’t the authentic Southern dumplings found in chicken and dumplings. 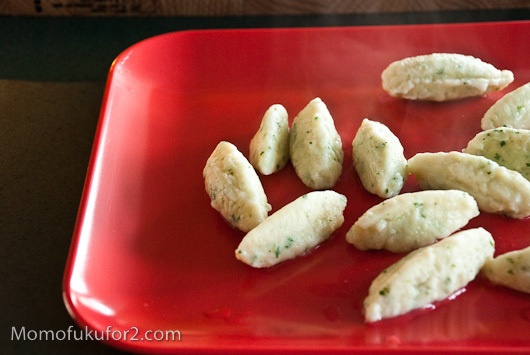 In true Keller style, the dumplings are quenelled, cooked, and cleaned up by trimming off the uneven edges. The dumplings are made with pâte à choux, which is a cream puff dough. 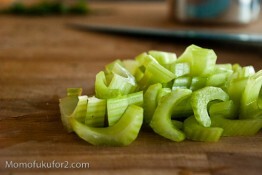 Most Keller recipes, no matter how simple, are time consuming, and this one was no exception. Chicken stock is flavoured with extra vegetable undertones by simmering gently with butter, slow-roasted leeks, onions, carrots and celery. 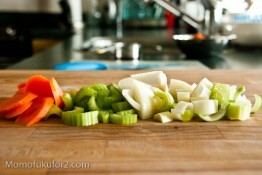 If you’ve ever made any of Keller’s recipes, you know the next step is to discard the leeks, onions, carrots and celery. Celery and carrots, sliced on the diagonal are found in the soup, but the vegetables fit for consumption are individually blanched; the celery in sea-salty water and the carrots with honey, bay, thyme and garlic. Individually blanching the vegetables seems like a skip-worthy step, but I find that the celery (which is peeled!) retains it’s crispness and the slight honey sweetness of the carrots adds a lot. Before the vegetables can be added to the chicken vegetable stock, the stock is elevated to crazy levels of deliciousness by thickening it with a roux. 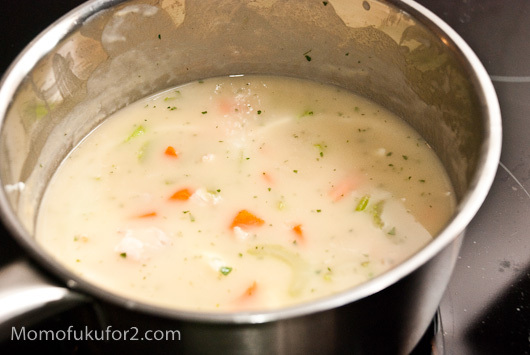 Thickening the stock with roux gives it a creamy luxuriousness that makes you swear half a pint of heavy cream is in the soup. It’s as decadent as chicken soup can get. This soup took a lot of time, but it was worth it. The dumplings were fantastically savoury and tender; they were so good, Mike I had had to split the last one in two. If you’re looking for a show-stopper chicken soup, this is it. 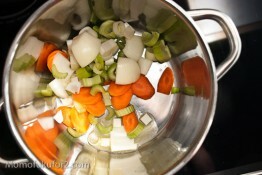 Melt the butter over medium heat in your stock pot and add the carrots, celery, onions and leeks. Place a cut out circle of parchment paper on top, reduce the heat and cook for 30-35 minutes, stirring occasionally. When the vegetables are done, add the chicken stock and simmer for about 30 minutes, then strain the soup base into another pot and discard the vegetables. 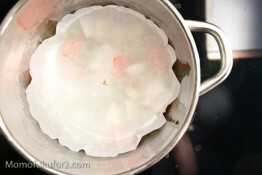 Fill a large pot with salt and water and bring it to a simmer. 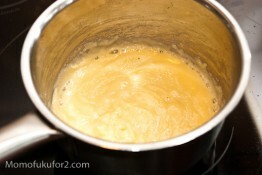 Combine the 1/4 cup water, butter and 1/2 tsp salt in a medium saucepan and bring it to a simmer over medium-high heat. 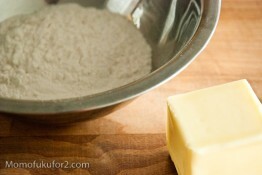 Add the flour all at once, reduce the heat to medium and stir rapidly. The dough will come together in a glossy ball. 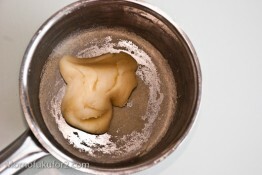 Continue to cook the dough for about 4-5 minutes, stirring constantly. A thin coating of dough will form on the bottom of the pan. Transfer the dough to a stand mixer and add the mustard, 1/4 tsp salt and mix to incorporate and release some heat. 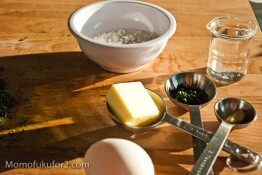 With the mixer on the lowest speed, add the egg and beat until it is completely incorporated. Add the flat-leaf parsley and stir in. If you don’t have a stand mixer, you can do this all by hand, it will just take longer for the egg to mix into the dough. Shape the dumplings into quenelles using two soup spoons to scrape the dough into oblong football shapes or just drop into the simmering water. 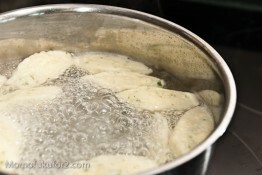 Once the dumplings rise to the surface, cook them for 5-6 minutes to ensure that they are cooked. Cut one open to make sure. Set aside. Melt the butter in a small saucepan over medium heat. When it is nearly melted, whisk in the four and cook, whisking constantly and adjusting heat as necessary so the roux bubbles but does not brown, about 3 to 4 minutes. Set aside to cool. 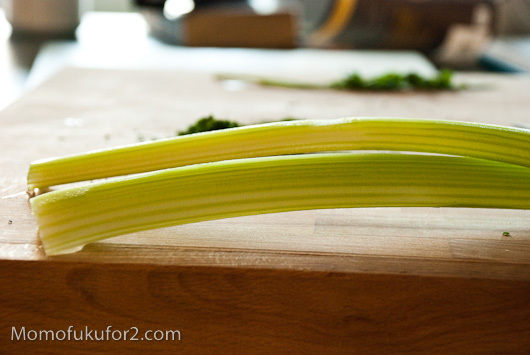 Blanch the celery briefly and put in an ice bath. 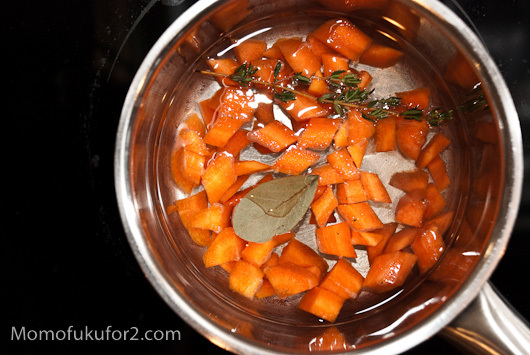 Cover the carrots with water and add the honey, bay leaf, thyme, garlic clove and salt and pepper. Simmer for about 4-5 five minutes, drain and set aside. Bring the soup base up to a simmer and whisk in the roux a little at a time until the soup is thick enough to coat the back of a spoon. Simmer and skim for 30 minutes. Add the dumplings, chicken, carrots, celery and chopped parsley. Season to taste and garnish with flat-leaf parsley leaves. Even Keller’s worst critics (those who have actually made his recipes) admit that his dishes taste great. Fussy, but excellent results. I told a friend of mine that is a sous chef about this recipe. The amount of work did not thrill him, although he wasn’t surprised that a Keller recipe involves all this. If you want potato flavor, I wonder if choux can be made with a mashed baked potato and bread flour? Maybe the gluten isn’t even that necessary. Or maybe gnocchi dough, perhaps with some leavening. Mmm, potato puffs sound awesome. And I think it’s possible! 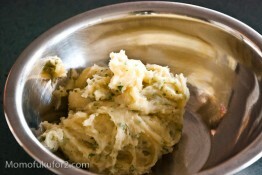 I’ll have to try potato dumplings sometime soon; I love potatoes!